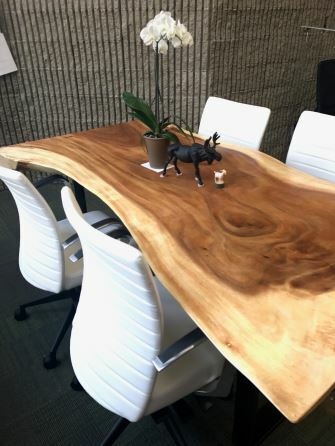 Here’s a sneak peak of the Niagara Falls Public Library installation featuring a Darran live edge conference table and Encore Seating Memento conference chair. More images to follow. Buffalo Office Interiors (BOI) has offices on Niagara Street in Buffalo, not too far from the Niagara Falls Public Library eighteen miles up the highway in downtown Niagara Falls, New York. Right now Buffalo Office Interiors is excitedly doing work at the Niagara Falls Public Library in the form of installing new tables and chairs there. Indeed, pictures showing the transition to a more modern looking and feeling library thanks to Buffalo Office Interiors will be posted on BOI’s website and social media channels in the days and weeks to come. The Niagara Falls Public Library dates way back to 1814 when citizens got together and started the Grand Niagara Library with some 40 books. Since then, the library has had different locations. Most recently, the Earl W. Brydges Building has housed the library since the mid-1970s. Nowadays, the library has several hundred thousand items. Since we live in a digital era where seemingly everyone is on their tablet or smartphone using the Internet for things like Facebook, Twitter, email and “surfing the web,” it only makes sense that libraries like the one in Niagara Falls should change with the times– that means updating the look and feel of the place to make it more welcoming and attractive to people. Therefore, it’s out with the old and in with the new– in this case, it’s time for modern tables and chairs that library users will find match their needs. The people who run the library believe in making efforts to “ensure that the library will remain a dynamic operation and provider of essential services in the community.” With that in mind, it makes sense to update the furniture inside, right? People want comfort and convenience. The Niagara Falls Public Library is becoming a more comfortable and collaborative environment with the addition of furniture “made for these times” from Buffalo Office Interiors. If you’d like to read case studies on how new furniture can really transform a place, visit this testimonials page. Read the first case, in particular, regarding the Hamburg Public Library. Buffalo Office Interiors has a hand in improving many public spaces, from libraries to schools. If your place could use some refreshing with regards to tables, chairs and other furniture pieces, don’t hesitate to call BOI at 716-883-8222.